A NEW education pack is being launched for Scottish secondary schools to help pupils learn the lessons of a mass genocide on European soil in the 1990s. The teacher training resource is being unveiled by the Remembering Srebrenica Scotland charity in Edinburgh to highlight what can happen when intolerance and prejudice takes hold. History and Religious and Moral Education teachers from across Scotland are attending a workshop to learn how the material can be effectively used in the classroom to help create a safe, tolerant society. Many young Scots are unaware that more than 8,000 people, mainly Muslim men and boys, were murdered in the Bosnian town by the Bosnian Serb army in 1995. 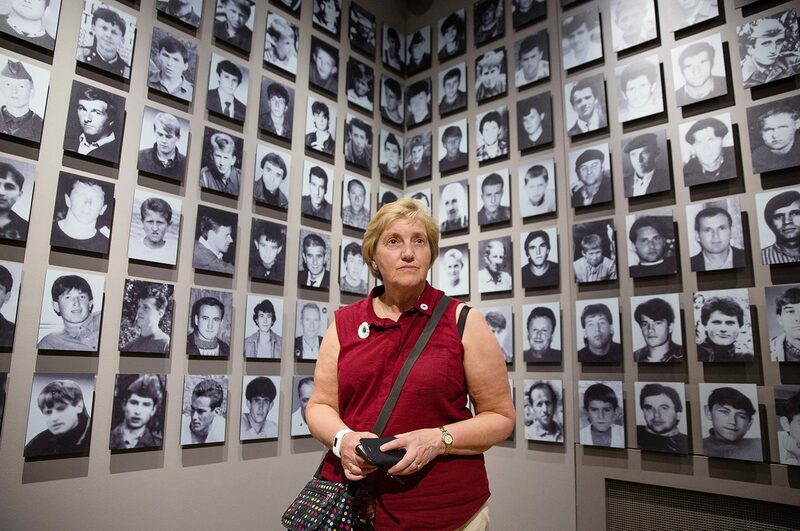 “Every time genocide happens, the world says ‘never again’, yet history shows that it happens again and again,” she said. “Understanding why it happens, and how it can be prevented, is crucial in the education of children and young people. “There is recent evidence of a rise in hate crimes towards those considered different and non-white even here in Scotland. “Our new and revised education pack will help young people understand how prejudice, discrimination, exclusion and intolerance diminish and degrade members of our community and may prevent them from taking and enjoying a full role in society. “The story of Srebrenica is not ancient history, it is a recent event in a European country and a reminder that genocide isn’t ‘something that happens somewhere else’. Dr Hood, who served Renfew North Parish Church for 37-years until she retired in 2016, said the charity’s aim is to help promote a “safe tolerant and cohesive society”. “We must begin in our schools and youth centres to help our young people understand the dangers of prejudice and hatred left unchecked,” she added. Police Scotland statistics show there were 900 cases of hate crime involving 11-15-year olds in 2016. And Crown Office and Procurator Fiscal Service figures showed there were 673 charges with a religious aggravation reported in 2016-17, 14% more than in 2015-16. Dr Nedžad Avdić, who survived execution squads at Srebrenica who killed his father and uncle, is one of the guest speakers at the event in the Edinburgh Training and Conference Venue. Former United Nations forensic investigator, Robert McNeil, who helped identify the bodies of people dumped in multiple, mass graves in Srebrenica, will also address teachers. Former Scottish Labour leader, Kezia Dugdale MSP, will speak on gender violence in Bosnia. The education pack was created by Robin Macpherson, Assistant Rector and History teacher at Dollar Academy, and Fiona Malcolm, Faculty Head of Humanities at Braes High School in Polmont near Falkirk. Mr Macpherson, a member of the charity board, said: “Our education pack has been designed to cover two core areas for teachers: subject knowledge and curriculum design. “We realise that events at Srebrenica are not widely known, so teachers need training to be able to deliver the programme. “Each school will have their own needs and context so the curriculum design materials have been created with this in mind. Miss Malcolm is a member of the charity’s education committee. Remembering Srebrenica Scotland was established as a charity in 2015 and organises commemoration events to mark the acts of genocide in Bosnia in the1990s. First Minister Nicola Sturgeon, Scottish Conservative leader Ruth Davidson and Miss Dugdale, who have all visited Srebrenica with the charity. It is holding an event in the Scottish Parliament this evening (May 30) to mark White Armband Day. This marks the day when the Bosnian Serb authorities in Prijedor ordered all non-Serbs to wear white armbands, and mark their houses with white flags, to identify themselves. It was an act with chilling parallels to the outward identification of Jewish people in the Holocaust.